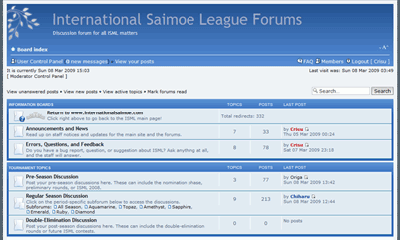 Visit our forum for tournament discussion and contestant campaigning. Predict the outcomes of matches and play ISML Fantasy! Post your signatures, fanart, and writings for other anime fans to see. International participation is welcome and highly encouraged! We hope to have a worldwide community that benefits everybody. Address your questions and suggestions to the ISML Staff as well. Stay tuned to site updates via our RSS Feed or on Twitter! or try a chat client by qwebirc or Mibbit right here on the website. or fill in the form below and click Submit Comment. We recommend the Mozilla Firefox web browser and a screen resolution of at least 1024x768 pixels for browsing ISML. Unicode capability in your browser is required for displaying contestant names. during a period of high traffic. If pages fail to load, please wait a few minutes before refreshing. At left, a promotional video (PV) for ISML created by mkak87. Below it, a PV for the ISML 2009 Championship contributed by ARTA8SIMS. The official PV for ISML can be found on the welcome page. Also, view the 2008 Double Elimination Tournament PV, compiled and timed by KholdStare. We invite anyone in our voting community to create videos for ISML and submit them to us! ISML Staff is currently running the tournament out of their own pocket. We are happy to do it out of our love for anime and for saimoe. However, we will graciously accept any gifts and offerings from our voting community if anyone wishes to contribute. All donations will pay for present and future server- and site-related expenses and upgrades. If you can offer a contribution, please visit our donation page. Thank you so much!